Washington (CNN) - Texas GOP Sen. Ted Cruz, who has repeatedly blasted fellow members of Congress and legislative staffers for accepting federal health insurance support, has revealed that his coverage is provided through his wife, a Goldman Sachs executive. 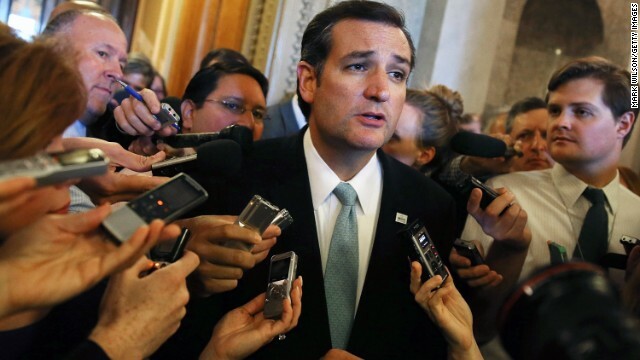 Cruz's office told CNN Thursday that Cruz is covered by his wife's policy. Heidi Nelson Cruz's policy is worth at least $20,000 a year, according to the story as originally reported by the New York Times. Catherine Frazier, a spokeswoman for the senator, told CNN that "the senator is on his wife’s plan, which comes at no cost to the taxpayer and reflects a personal decision about what works best for their family." Frazier had previously given the same statement to the Times. Cruz was criticized by Democrats and some Republicans during the recent government shutdown debate for his calls to strip federal health care support from members of Congress and both legislative and executive branch staffers. Cruz’s critics argue that the support is no different from what other large employers provide for their workers. Their anger has been magnified by suspicions that the senator does not have to rely on his employer – the U.S. Senate – to get coverage. Cruz and other Republicans argue that ending the subsidy is only a matter of fairness, and that public officials should be required to get coverage through the Obamacare exchanges with no financial assistance. "Cruz’s critics argue that the support is no different from what other large employers provide for their workers." Cruz’s critics argue that the support is no different from what the ACA requires other large employers to provide for their workers. FIFY...you whitewashed important nuance that shows why the Cruz camp's argument that it would be "unfair" and would be an "exemption" is complete and utter garbage and a lie. cruz is making the exact same decision mnay millions of americans make every year. you choose the best plan for your particular circumstanace. this article is nothing more than an attempt to smear cruz. actually, his current healthcare choice is saving the taxpayers money. he should be applauded. the leftists in this country just continue to twist facts to try and smear people. truly pathetic. Oh leave Ted Cruz alone, he's perfect. Is this the kind of comment you want Fox-lite? All senators, congress people need to be barred from Government Coverage. They need to buy just like ordinary citizens. This nation needs term-limits too. Why am I not surprised that Senator Cruz has been chowing down on green eggs *and* ham all along? The only thing that surprises me here is that his wife never pointed out to him that wrecking the economy would also bring his private gravy train to a screeching halt. But then I suppose his supporters will claim that this just shows how "principled" he is. In a box. With a fox. And with $20,000 worth of platinum insurance that he doesn't have to earn or pay for. can we please a full disclosure of all the demorcat senators and their healthcare plans? and while we are at it, how about nancy pelosi too. most of these people are millionaires and i doubt they even use the government programs but instead purchase the best plan out there. wouldn't you do the same thing? or are the leftists suggesting that nobody can have a plan any better than everybody else? total equality, but at a very low level for everybody. So his wife is an exec at Goldman Sachs...hmm...it would be interesting to know how much money they made by making bets based on the government shut down. "Their anger has been magnified by suspicions that the senator does not have to rely on his employer – the U.S. Senate – to get coverage." Is it any surprise to anyone that Mr. Cruz has demonstrated some more blatant hypocrisy. Catherine Frasier said the decision "reflects a personal decision about hwat works best for their family"
his hand would be in the same government pot. about him and his Daddy, you wouldn't either. "saving the taxpayer money"??????????????????? Wow, I don't call $24B wasted on his tantrum a "savings". Mis-guided Cruz at it again. The word hypocrite doesn't begin to describe this man's behavior. When will the moderate Republicans take back their party from these lunatics. Where are you Colin Powell ? Now that's a congressional investigation/hearing that REALLY needs to happen! At least he is doing the noble thing and not using taxpayer funded health care. I applaud him. Wish there were more of him. Cruz is a false prophet in this fight over health care coverage. Yes, he doesn't get his health care from the government, but, no, he doesn't relate to the average America. His wife works for Goldman Sachs, folks. If the government were providing coverage as elusive as Goldman Sachs, a fortune 500 company, he'd take it in a second. This is a man standing next to disgruntled Americans who distrust banks & million dollar corporations in the same light as they distrust the government, yet he eats the fruit off those financial giant's tree. He is a fraud. He does not fight for the average American, he fights for his donor's pockets.